I Turn the Pages: Star Darlings Blog Tour: Create Your Own Star Darling + GIVEAWAY! I have SUCH an exciting post to share today! 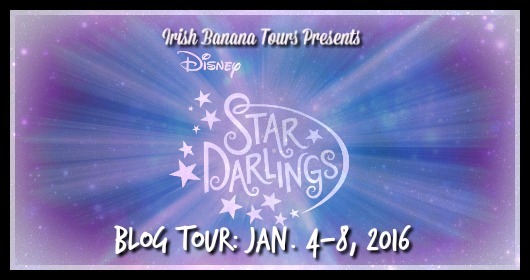 Thanks to Hannah @ Irish Banana Review/Blog Tours and Ms. Zissimos from Disney for allowing me to be a part of the Star Darlings Blog Tour! Have you ever wondered what happens to your birthday wish after you blow out the candle? Where does it go? How does it come true? Starworld is the brightest star in the galaxy, and it takes in all of the magical one-of-a-kind wishes and helps to make them come true! But, there is a problem - the humans aren't wishing anymore! The Star Darlings books, online shorts, dolls and activities follow 12 STAR-MAZING girls who are given an opportunity to save their planet, Starworld, from this devastating problem. With some training and guidance from their Principal, these girls will do anything they can to become wish-granters, along with saving the entire planet! But these Star Darlings face some inner problems of their own. They don't really know each other that well either. Will they be able to save their planet, and still get along? Today, I will creating my own Star Darlings to go on Wishworld missions with the REAL Star Darlings themselves! Isn't that exciting?! Here is my very FIRST Star Darling Character: Mellena! This is my Star Darling, Mellena! As you can tell, she absolutely loves the color pink! Of course, she is always busy with school work, trying to learn all that she can about wishes, but when she is not reading her wishology textbook, she is practicing her ballet for the big school recital! Her style is constantly changing, her hairstyle changing from curly, to braids, to even just a beanie on her head. But it looks good on her, and she knows she can rock it! She also shows her friends how to braid their hair, and helps them pick out their outfits for any Starworld outings they go to! A dark purple flower, with dark blue in the middle of the plant. An interesting color combination for an interesting girl! Mellena's wish pendant is: her heart shaped ring! Crystal with blue at the core and pink on the outer rims. Seems to fit Mellena perfectly! Okay, now of to the fun description of my Star Darling. Sheridan clearly loves anything and everything floral or anything from the forest! In the morning, sometimes she struggles to wake up when her alarm goes off, so her hairstyle switches constantly from a very-well put-together braid to bedhead! Hey, life can be tough when you are trying to save Starland! Don't doubt Sheridan, even though she struggles with her mobility, it doesn't limit her in any way! The Star Darlings (thanks to mostly Vega and Scarlet) have found a way so that her wheelchair doesn't get in the way of any missions in their future. Of course, she needs a lap desk to take notes in class, and her friends to assist her to her next class, but that doesn't make her any less independent. She has a love for animals, and shows that by bringing a stuffed cat from Wishworld everywhere that she goes. It's one of the only things that she holds truly dear in life (aside from her books), and like Scarlet, she shares a desire to explore Wishworld and learn as much as she can! A bubbly flower, pink, as always. These flowers seem to be blooming in the shape of hearts! Sheridan's wish pendant is: her special arrow necklace! Yet another pink crystal, this time with hues of purple mixed in as well! Why not have a colorful crystal? Wasn't that FUN? It was STAR-MAZING! Answer this in the comments down below: If you could make your own Star Darling, what would you name her? What would her favorite color be? What is her wish blossom? Is she friends with any of the other Star Darlings? What is her goal in life? (You can base this off of yourself!) If you need some inspiration, you can head HERE to look at the other Star Darlings!